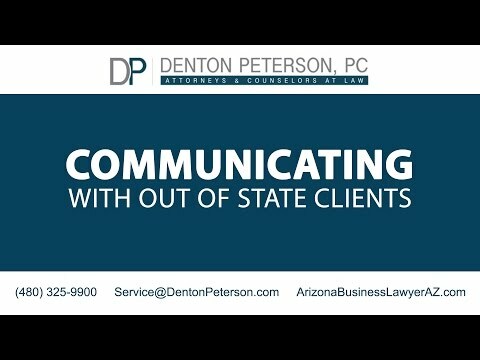 Arizona Mediation Attorneys & Negotiation in Mesa | Denton Peterson, P.C. Our attorneys at Denton Peterson, PC are well versed in negotiation theory and practice. Our Arizona attorneys know that the ability to negotiate through complex problems is a skill set that can continually be improved. We completely recognize that litigation is formalized negotiation, where the law provides rules of substance and procedure in resolving a matter. That is why a welcome consequence of litigation is wisdom. Wisdom is the correct application of knowledge to a given situation. Wisdom is what potential clients are seeking or should be seeking if they care about the outcome of their matter. Tremendous amounts of effort have gone into the wealth of knowledge that our attorneys offer our clients. Our goal is to educate our clients in both negotiation theory and how the law interacts with a situation. With this knowledge our clients can make informed decisions based on advice from trusted counsel. The decision to make a claim is often an uncertain step that individuals take. We will discuss with you whether it makes sense to proceed in a formal setting or use alternative dispute resolution. By this we mean to explain to you the strengths and weaknesses of formal proceedings meaning litigation, or using alternative dispute resolution. Alternative dispute resolution is underpinned by negotiation. Our attorneys regularly participate in settlement conferences, mediations, and arbitrations with our clients. That is why it is important to have a skilled professional help you through a given dispute. In legal negotiations information flows way faster and harder than it would in trial. There are not rules of procedure or evidence to slow things down. There are interventions used such as caucusing (which is having the room to yourself and your attorney) so that you can experience the emotional intensity of the situation and vent without being judged. Preparation is key to having an effective experience with alternative dispute resolution. That is why our attorneys prepare our clients for the experience of a mediation, settlement, conference, or arbitration. The draw of alternative dispute resolution is that matters may be resolved much faster, in a confidential setting, and at a lower cost than litigation. Generally the mediator, Judge Pro Tem, retired Superior Court Judge, or arbitrator will have extensive experience in conflict resolution. Another draw is that ADR can be used before a claim is made or after it is made in order to resolve the claim. However it should be noted that not all claims are settled in ADR. Thankfully in many legal negotiations there are agreements reached that end the dispute or at least limit the scope of the litigation going forward. Courts of general jurisdiction may set up ADR programs to help with case management and disposition of civil matters. Judges appreciate the opportunity to take a matter off of their docket and send it to a judicial officer who has been approved by the Superior Court. Often the Judge will wait until discovery is finished. Settlement conferences are scheduled by the court staff. The parties must appear in person or make a motion to appear telephonically. The purpose is to see whether a matter can be resolved before too much time, effort and money has been invested in the litigation process. Settlement conferences are negotiation-heavy. That is why you want a skilled negotiator representing your interests. Before going to a settlement conference it is important to plan what is part of the deal and what is not. Our attorneys will talk with you about creating and distributing value within the settlement conference. In Arizona, the judicial officer may be a Judge Pro Tem (basically a volunteer part-time judge), or a retired Superior Court Judge. The judicial officer should care about party self-determination. The judicial officer should be neutral and impartial. In order to be a Judge Pro Tem, a licensed attorney must have at least five years of practice in the law of the jurisdiction of the court and have demonstrated good moral character. Prior to the beginning of the settlement conference the judicial officer reviews all of the pleadings and familiarizes himself or herself with the case. The conference is generally three to four hours in length. Parties are able to evaluate the performance of the mediator at the end of the settlement conference. If the matter is not resolved a trial date is given and the litigation continues. Mediation is a process where a neutral assists both parties with negotiation. It is a voluntary and confidential process. Good mediators know that effective mediation is about finding ways to help the parties communicate. Many mediators are trained in psychology, sociology, or have a background in social work. A mediator who has a law degree should be sought out for his or her familiarity with the subject matter, and ability to bring parties to agreement. Ask the mediator what his or her experience has been and the kind of claims they have mediated. Private mediators generally charge per hour, but some have flat rates. Our Mesa litigation attorneys have extensive experience with helping our clients chose a mediator. The mediator can have an important impact on the outcome, so we choose carefully. Mediators generally have a variety of skills associated with communication and negotiation. Mediation is a process that is designed to react to the emotional intensity of legal negotiations. Good mediators know when to slow things down and use different interventions to assist with the negotiation. A mediator should care about party self-determination and informed consent. A mediator should be impartial and neutral. Generally the parties will select a mediator together, based upon advice from their attorneys. At the beginning of a mediation, the mediator will explain the process to the parties. The mediator may lay down some ground rules about going forward. Speak with the mediator about the length of the mediation. Private mediations can last longer than settlement conferences if the parties need more time to work through the different issues. We have been in mediations that went late into the night, or extended through more than one day. The draw of mediation is that a skilled negotiator can help parties resolve their differences in expectations. Another draw is that parties get more opportunities to talk through hard issues. People are generally happier with the outcome when they are making the decisions. It should be noted that not all mediations reach agreement. Learn more about the guidelines of mediation here. Out of the alternatives to litigation, arbitration is the most similar to litigation. Parties give arguments. Evidence is reviewed and a decision is rendered, which is called an award. The arbitration can be binding or non-binding. It is difficult to appeal a binding decision. Arbitration is generally used with business disputes or employment disputes. The arbitration can be either voluntary or mandatory, depending on the claim. Arbitrators are generally seasoned attorneys or retired judges. They should have practiced in corporate, business, or employment law. We can assist you in selecting an arbitrator. The draw of arbitration is that the results are generally quicker than it would take to move a matter all the way through trial, and is usually less expensive than litigation. The difficulty of challenging an award is another draw, because parties like the finality of an arbitration award (which can be reduced to judgment relatively quickly if necessary). until we have been retained. We value your privacy. Our Arizona litigation attorneys know that the use of the correct negotiation tools can determine the outcome of a case. If you are seeking an articulate advocate for your specific situation, please contact Denton Peterson, PC. Additional Practice Areas – Denton Peterson P.C. Please be aware that client attorney confidentiality does not exist until we have been retained. We value your privacy. Brad Denton mediated a dispute involving four business owners who were disputing how their business would be run. Sterling Peterson and Brad Denton have participated in numerous court-ordered arbitrations on behalf of clients in Maricopa Superior Court. Brad Denton and Sterling Peterson have represented various clients in mediations where cases have settled on terms agreeable to our clients. Where necessary, our lawyers have refused to settle cases at mediation, because the terms offered by the other side simply didn’t meet our clients’ expectations and the realities of the case. Brad Denton and Larry Dunn represented a client in a personal injury case involving an underinsured individual and significant medical lien issues. After filing a lawsuit on behalf of our client, we were able to obtain for our client a seven figure monetary settlement and to resolve medical liens worth several hundred thousand dollars to the advantage of our client. Litigation how does it begin?